Should Israel come out of the nuclear closet? Should Jerusalem bring its bomb out of the basement? Israel, for at least the moment, is the sole possessor of atomic weapons in the Middle East, with an arsenal that now includes approximately 200 warheads. But it is also the only nuclear-armed nation to hide its cache behind a façade of official silence–neither confirming nor denying its existence. Iran’s mounting nuclear capability arguably demands a reconsideration of this stance. Explicitly announcing its nuclear status would have its advantages. It would upgrade Israel’s deterrent. It would send a clear message to the mullahs and their allies. But disclosure poses its own challenges. The nuclear pariah spotlight now shines on Iran. Were Israel to declare itself a nuclear power, that attention would instantly shift to Jerusalem, given global political biases. It could legitimate Iranian nuclear weapons in the court of international opinion. What’s more, Israel’s declaration could ignite (or excuse) Arab pursuit of nuclear weapons, bringing yet more peril to an already unstable region. Still, there’s a clear need for Israel to better leverage its arsenal. This tricky task requires that it complicate the mullahs’ risk calculations, without exciting the Arab street. It calls for a new policy, where the country finds subtle ways to draw attention to its nukes without explicitly abandoning its current posture. Call this approach Opacity Plus. It may represent Israel’s best hope for foiling Iran. Having won its War of Independence in 1948, Israel looked out at a daunting strategic landscape. Surrounded by adversaries with growing military capabilities, Israel had only a modest military force of its own. It had also failed in its efforts to enter into a military alliance with either Europe or the United States. And, with lingering fears that the Holocaust might repeat, David Ben-Gurion latched onto the notion that nuclear weapons would provide the ultimate security blanket. Without resources to move forward on its own, the Jewish state aggressively cultivated France, which had fired up its first research reactor in 1948 and, soon after, invited scientists from Israel’s Weizmann Institute to collaborate on nuclear research. By 1953, Israel and France entered into a formal agreement on nuclear cooperation. Following the Suez crisis, that relationship grew even closer. With Paris’s help, around 1963, Israel opened its own reactor in Dimona, a remote corner of the Negev desert. Washington wasn’t pleased. It was obsessed with curtailing the spread of the bomb. And, by the end of the Eisenhower administration, it began raising questions about the Dimona facility. Those questions fell to President Kennedy, who would make the lone serious effort to halt the Israeli program. Unconvinced by Ben-Gurion’s repeated assertions that Dimona served civilian purposes, the president demanded the Israelis halt their efforts, even threatening to re-evaluate the whole relationship. Because of Lee Harvey Oswald, that confrontation never happened. While Lyndon Johnson attempted to leverage American military exports to coax Israel into signing a nuclear nonproliferation treaty, he ultimately let the issue slide. Golda Meir and Richard Nixon finally arrived at an informal understanding in a 1969 meeting in Washington. The American president agreed not to impede Israel’s weapons ambitions, so long as the program remained opaque–meaning, no testing of weapons and no public announcement of them. So began the enshrinement of Israel’s policy of nuclear ambiguity, endorsed by all subsequent American presidents, Barack Obama included. In the years that followed the Nixon-Meir agreement, Israeli leaders repeatedly declared the country “would not be the first to introduce nuclear weapons into the region.” To enforce this pretense, the government avoided all public discussion, even in the Knesset. Censorship laws also prohibited wider talk of these weapons. Keeping the bomb in the basement had its advantages. Despite regional suspicions and concerns–Gamal Abdel Nasser mulled a preemptive attack–Jerusalem’s determination not to flaunt its capability by testing its weapons dampened Arab demands for a response in kind. The result: Egypt never allocated resources for a serious nuclear effort. Neither did Syria, until 2001, when it began building a secret reactor. Over the years, Israel’s program generated a certain mystique. Despite an occasional gaffe–in a 2006 German TV interview, Prime Minister Ehud Olmert let it slip that Israel had nuclear weapons, “as France, America, Russia” do–the only serious breach took place in 1986, when the Israeli nuclear technician Mordechai Vanunu provided the Sunday Times of London with photos and documentation of the hidden Dimona infrastructure. The media splash dissipated in time, but questions lingered: Does the arsenal include thermonuclear devices? Tactical nuclear weapons? What is the operational status? Absent explosive testing, how reliable can the weapons be? What would the weapons target? What would be the risks of radioactive fallout for Israel? 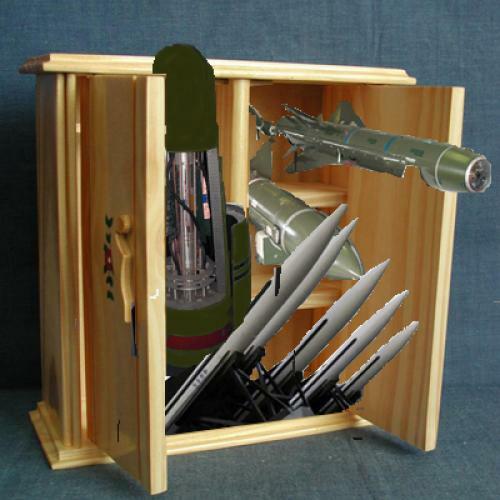 Above all: What would prompt Israel to use its arsenal? Since independence, the country has fought two wars of survival, in 1967 and 1973. Both offered opportunities for nuclear flexing, at least to intimidate its enemies. Still, the arsenal remained under wraps. In the Six Day War, Israel had a small number of unassembled weapons without a clear mission. Its swift victory meant that it never had to implement a plan to conduct a demonstration test in the desert. Six years later, when a far more perilous war broke out, Israel evidently still did not have a practical strategy to use or threaten to use the arsenal. This pattern of behavior replicates that of other nuclear countries. American, Soviet, and Pakistani forces all have reportedly increased their nuclear alert status in crisis or war, but they never cocked their weapons to a timer. Over the years, Israel has never felt compelled to change its opaque course. It found other ways to address the nuclear ambitions of its emerging rivals. As suspicions about Iraq’s nuclear intentions grew in the late ’70s, and Paris refused to halt its nuclear export to Baghdad, Jerusalem sabotaged Saddam’s reactor core prior to its shipping; bombed the headquarters and apartment of the director of the Italian manufacturer of the plutonium separation plant Saddam had ordered; and assassinated an Egyptian-born scientist assisting Iraq, and, some speculate, two Iraqi engineers, one in the French capital and the other in Geneva. In June 1981, it used aerial sorties to destroy the Osirak reactor. And, in September 2007, Israel didn’t bother with any of the preliminary steps it deployed against Iraq: It simply bombed Syria’s clandestine nuclear plant. Iran presents a more complex challenge. Where Iraq and Syria provided visible, vulnerable, and solitary nuclear targets, Iran has heavily bunkered and geographically dispersed its key sites. There remains concern that even a successful strike will only temporarily set back the program, especially if Tehran were to follow in Iraq’s footsteps. Within a decade of the Osirak bombing, Baghdad reconstituted its weapons effort. Only the serendipity of the first Gulf war brought international inspectors into the country with authority to halt a program that was within a year or two of producing nuclear weapons material. History shows that there are only two ways to stop a country bent on nukes. You can defeat a nuclear aspirant in war–as the 1991 conflict and World War II illustrate–or you can coax it into voluntarily relinquishing its ambitions–what happened with the programs in South Africa, Ukraine, Belarus, and Libya. Israel finds itself at a nuclear fork in the road, should international efforts to halt the mullahs fail. Iran has little reason to believe Israel will lift its historic nuclear self-restraint in crisis or war. This will encourage the mullahs to believe that they can game their arsenal for coercive advantage. Unless Israel disabuses Iran of that presumption, it will lose the benefits of nuclear deterrence. Bringing the bomb out of the basement would appear to be a logical solution to this problem. But the Middle East presents a more complicated strategic tapestry. A nuclear revelation might encourage the likes of Egypt, Turkey, Saudi Arabia, Syria (again), and others to reconsider nonproliferation vows. It would allow Tehran to rally the region, claiming to be the atomic protector of Muslim interests. But there’s an alternative, what I call Opacity Plus. Israel would implicitly break its nuclear silence through calculated acts that would shake the mullahs’ nuclear calculations. It needs to remind the world of its arsenal and hint at its willingness to use it, through disinformation and rumors conveyed to global reporting outlets and respected commentators. Israel should lift the censorship that blocks much domestic discussion of the bomb to allow a cacophony of debate among the country’s chattering classes, to generate “crazy” as well as tempered ideas that would sow doubt about Israel’s intentions in the mullahs’ minds. Opacity Plus may not appear to be a dramatic change in policy. However, absent some show of nuclear ankle, Israel will squander its nuclear leverage. For a country that has refused to officially say anything about its nuclear capability–reflecting not simply a strategic decision but implied discomfort with the bomb–it would enhance its defensive capacity. This strategy would bring other benefits. It would bolster U.S. efforts to build a more durable and credible deterrent against Iran. And it beats the alternative: an explicit announcement of Israel’s arsenal, which would upset Washington’s nonproliferation efforts. Opacity Plus–alongside the security umbrella being built by Washington across the region and the not-insignificant sanctions now in place–represents a multilayered strategy that could checkmate Iran’s nuclear gambit. The mullahs may act dismissive. They may argue that Israel is a paper tiger and the United States a worn superpower. But bluster cannot compensate for new risks. Bennett Ramberg has served as a foreign policy analyst and a consultant to the Department of State, U.S. Senate, Nuclear Control Institute, Henry Stimson Center, Global Green and Committee to Bridge the Gap.